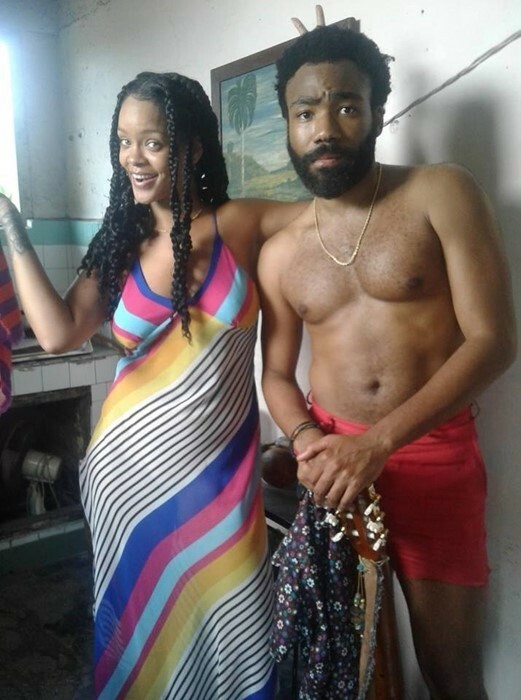 (Billboard) Remember when photos of Donald Glover and Rihanna filming in Cuba sent the internet into a frenzy last summer? The outcome of that mysterious collaboration is finally here. Glover rolled out his short film Guava Island with numerous stunts at Coachella Valley Music and Arts Festival’s first weekend, ahead of his headlining set Friday night (April 12) as Childish Gambino. Glover tapped his Atlanta and “This Is America” music video director Hiro Murai for the film, which co-stars Rihanna, Letitia Wright (Black Panther) and Nonso Anozie (Game of Thrones). The plot centers on a musician named Deni (played by Glover) who tries to put on a music festival in his island hometown. Glover weaves his songs “This is America,” “Summertime Magic” and “Feels Like Summer” into the film, while Rihanna, who plays Deni’s girlfriend, doesn’t sing. Notably, Gambino made no formal mention of the project at his closing Friday set, though his performance featured plenty of island imagery — like palm trees and volcanoes — and tropical sounds blared out of the speakers between songs.